In January 2010, AdEdge Water Technologies, LLC was contacted by Aqua Utilities Florida to provide a hydrogen sulfide removal system for the Lake Josephine Community located in Highlands County, Florida. 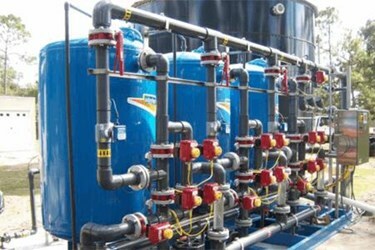 The existing water system consisted of two wells feeding into a centralized distribution system with a maximum capacity of 230 gpm being consumed by a population of 1,250 persons. The raw water well water contains high levels of hydrogen sulfide which produces objectionable odors in the customers’ tap. The treatment goal for the Lake Josephine system is reduce the levels of hydrogen sulfide to the non-detectable odor threshold <0.05 mg/L. The AdEdge treatment system features a skid-mounted AD26 oxidation and filtration package unit sized for a maximum design flow of 230 gpm. The model APU26-4260CS-3-AVH utilizes AdEdge AD26 media in a three vessel carbon steel configuration in parallel. The system is equipped with automated control valves and harness, central control panel with programmable logic controller (PLC) and a color user interface screen. System features also include differential pressure switches, control panel and local gauges, flow sensors and totalizers, and a central hydraulic panel with sample ports for a complete functioning packaged unit. Each 42-inch diameter treatment vessel contains 30 cubic feet of AdEdge AD26 oxidation/filtration media. AdEdge AD26 is a NSF 61 certified manganese dioxide media.